COLORED CONFEDERATES Wins Another Award! See You at the Real to Reel International Film Festival Tonight!!! COLORED CONFEDERATES: Myth or Matter of Fact? will be screening at the Real to Reel International Film Festival tonight!!! Tell a friend! Bring a friend! 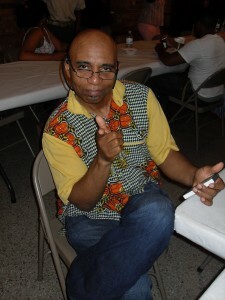 That’s me chillin’/prepping at the Battle-Arrington Family Reunion in North Carolina last weekend. I really am thankful for the Guest/Presenter invitation. It was the first time I’ve ever screened one of my films at a family reunion. Thank you kindly for all of the warm words about, COLORED CONFEDERATES: Myth or Matter of Fact?, as well. In addition, what a fascinating experience it was to learn your family’s history!!! COLORED CONFEDERATES: Myth or Matter of Fact? screens at the Real to Reel International Film Festival in Kings Mountain, NC on July 18th and the festival continues through July 21st. Come on out! I look forward to meeting you in person!